There is something magical about a great bowl of Japanese ramen noodle soup. It’s absolutely wonderful. If you’ve never had good ramen go out and get some. Just do it. Today. Noodles. Broth. Pork. Egg. Wow. 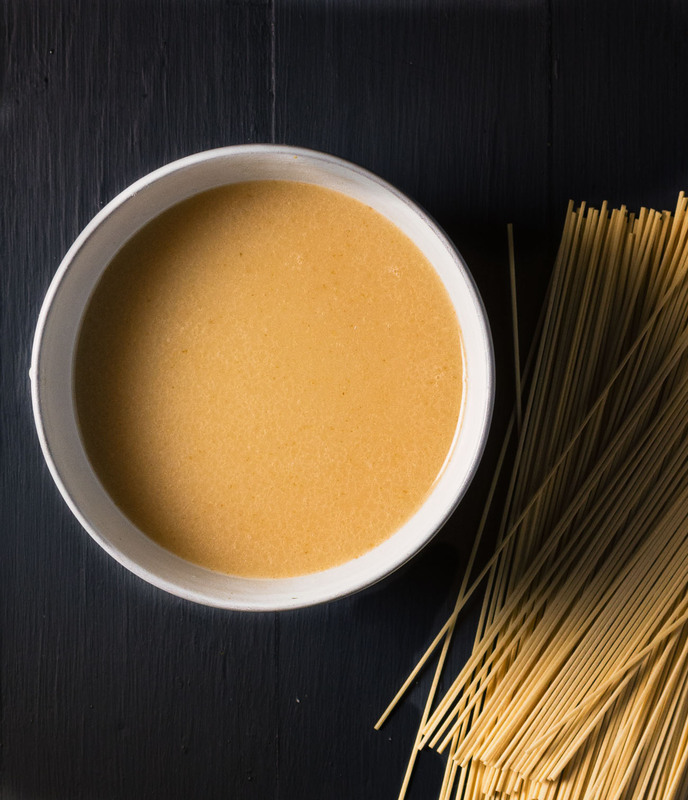 If the noodles are the backbone, the tonkotsu ramen broth is the heart and soul. This is a descent into madness. I’m making the tonkotsu ramen broth from scratch. I’m cooking pork belly. I now know the difference between the 7 minute and 7 1/2 minute egg. I’ve figured out how to make spaghettini into the alkalinated noodles. I’ve replicated the Momofuku pork belly. Got a lesson in their kitchen for that. For real. 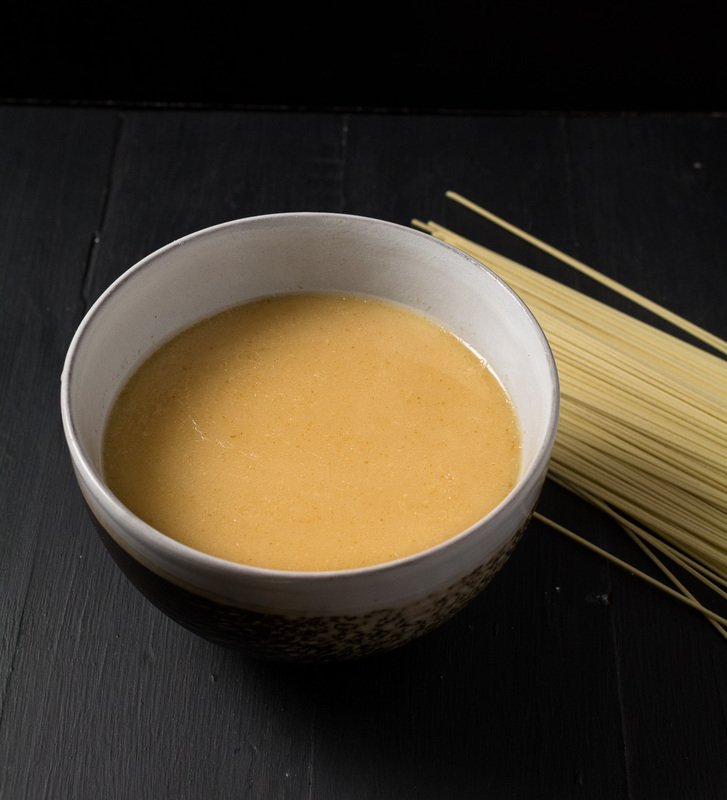 The rest of the tonkotsu ramen recipe is here. All this work so I can maybe come close to the $13.00 bowl of ramen at my local ramen joint. Crazy. Follow me only if you are crazy too. Or you just love ramen as much as I do. Turns out it’s pretty easy. And it’s delicious. Good living. Making tonkotsu ramen broth is a real eye opener. If you know how to make classic French meat stocks forget everything you know. This broth is cooked at a roiling boil for 12 hours. A rolling boil. The absolute antithesis of the French technique. There’s a lot of Asian technique here that you don’t see in classic western cooking. Blanching the bones is a big one. And a really good one. Add all the bones to a pot. Bring to a boil. Cook for about 5 minutes. Then dump it all out and rinse the bones. I’m not a fan of putting flavour down the sink. But in this case it’s genius. Doesn’t make a difference to the end flavour. But it does get rid of all that muck floating on the surface of the stock. Muck that would get boiled into the stock. Muck that would likely ruin the broth. Did I mention this is genius? But something happens when you cook pork bones at a rolling boil. All the gelatin and fat and goodness comes out of the bones and turns the stock that milky white colour. If nothing else, this experience was absolutely fascinating. Just make sure you keep adding water to keep the bones submerged. You can find videos on youtube of Japanese ramen joints making their broth. Huge pots of stock boiling away. They don’t cover their pots. But they have staff in the kitchen full time. You can try it uncovered if you are planning to hang out in the kitchen all day. Your call. I don’t though. A loosely covered lid keeps some of the evaporation in check. You still need to pay attention though. You are maintaining a rolling boil for 12 hours. Covered or not it can boil dry. And that’s a whole world of hurt nobody needs. This ramen broth is delicious. This part is nailed. Nothing to it really. Just need to follow the recipe. No secrets here. Not anymore. The tonkotsu ramen turned out pretty amazing too. This is base. The foundation to a great bowl of ramen. You can make just about any tonkotsu style ramen with it. Next step is the tare. That’s what pushes it in different directions. Shio. Shoyu. Miso. Your choice. Tonkotsu ramen broth. Not the quickest way to make something great. But so totally worth it. Tonkotsu ramen broth is simply pork bones cooked at a rolling boil for 12 hours. The process extracts all the goodness of the pork and turns the broth creamy white. Place the pork bones in a large stock pot and cover with cold water. Bring to a rolling boil over medium high heat. At this point a huge mess of scum will form. Remove from heat. Dump the water and carefully rinse all the bones under cold running water. Return the bones to the stock pot. Cover the bones with cold water and bring to a rolling boil. Add the mushroom and onion and maintain a rolling boil for 12 hours, replenishing the water along the way. You want to keep the bones under water the whole time. It's best to cover the pot for this or you'll be adding water every 30 minutes. After 12 hours, remove the stock from the heat and cool slightly. Remove the bones with a slotted spoon and strain the stock. The stock will keep in the refrigerator for 2-3 days or can be frozen at this point. The broth is flavoured by the tare of your choice. There are two good one's in the tonkotsu ramen recipe. In japanese, sides and stuff, soup. Bookmark the permalink. 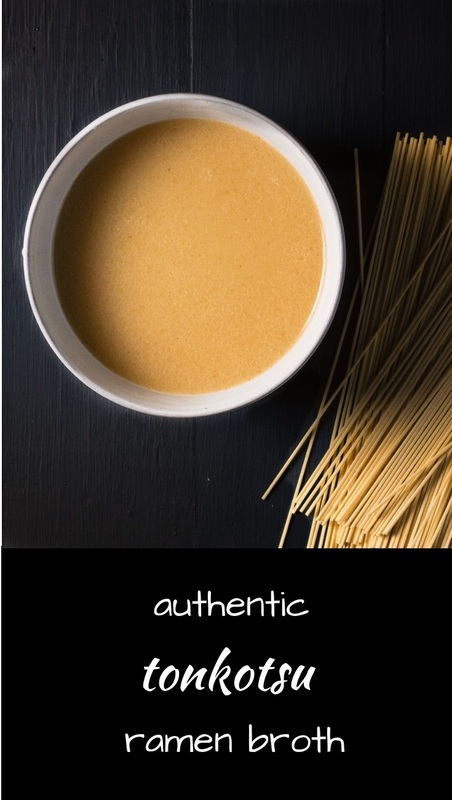 This broth looks so SO flavorful, Romain! 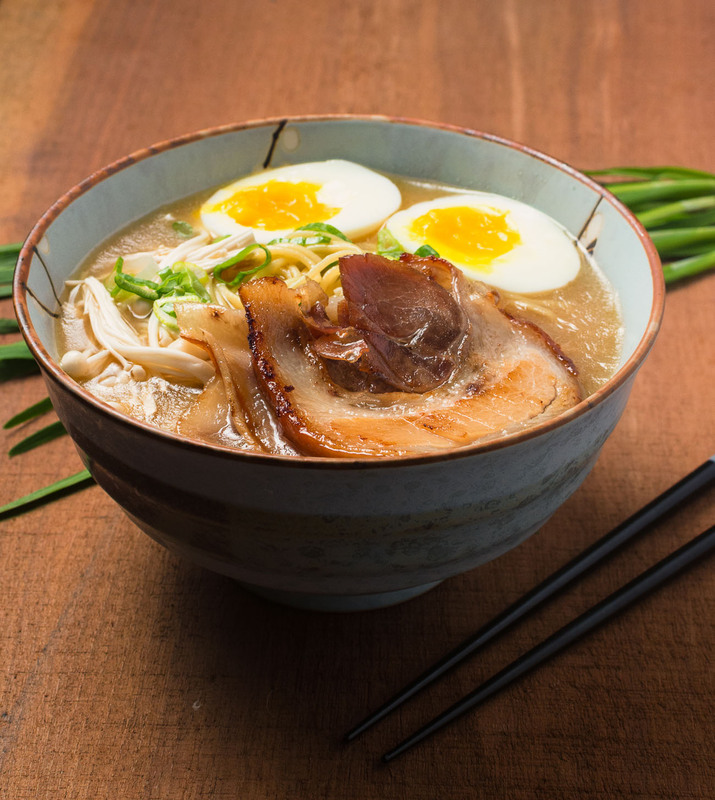 I’m all about tonkotsu broth– it has by far the most flavor. 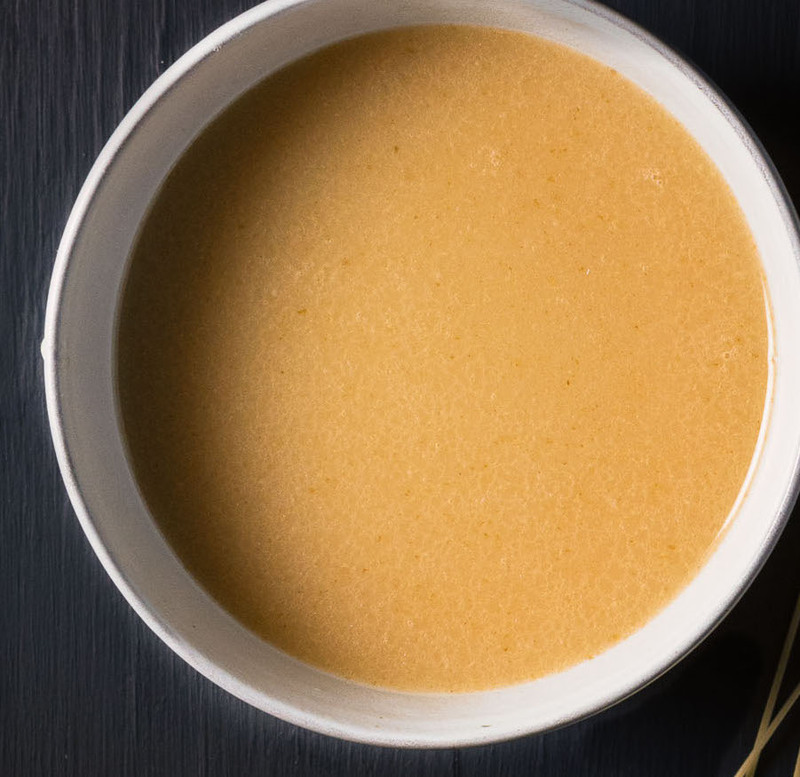 This soup makes a beautiful base for a lot of different things from miso soup to ramen to using it to flavor sauces. I must try this! Flavouring sauces is a thought that hadn’t occurred to me. Thanks for the idea! Hillary – it’s coming soon! When? Please….. I eat breathe and sleep ramen. I’ve finished this one off with the tonkotsu ramen recipe. I also have the Momofuku pork belly recipe as well as an easier miso ramen with chashu pork. If you want something a bit different I have recipes for curry ramen and a Korean spicy ramen. Where can I buy pork bones from? And is there any bone in particular? I can easily find beef knuckles / beef bones labeled for soup at the grocery store but I’ve never seen pork bones. Pork neck bones work well and are the cheapest. I’ve only seen pork bones rarely at a regular grocery store. Butchers and asian grocery stores are where I get them. I find them to be cheaper at asian grocery stores so that’s probably your best bet. I go to an ethnic grocery store to get my pork bones (they have a lot of meat and run about $1.69 lb. )or if you have a local butcher ask him to save them for you. My local grocery occasionally butchers up pork and saves me the bones. Find an Asian Market in your area. Any Asian market worth a hill of beans and has a meat dept will have this and much more. I find that they often have the freshest fish as well as the move through stock quickly. ps.. I sent a picture of my broth to the instructor of the cooking class. Sorry charlie but you should try this. There’s a new chef in town. Muahahahaha…. Thanks for this. I’ve updated the recipe to clarify. You need to add enough water to cover the bones. That depends on the size of your pot. I also added a recommendation to loosely cover your pot. It doesn’t matter much one way or the other. Uncovered is probably best but loosely covered will cut down on how closely you need to monitor it for evaporation. Thanks for the reply! I successfully created the broth after a looong 12hrs of waiting. My question now is: roughly how much broth should boiling 6lbs of pork neck bones produce? I ended up with about 8 cups but it seemed too thick to me so I watered it down to 10. After putting it in the fridge it turned to thick jelly with a nice layer of fat over it. Should it be diluted more? Chris – sounds like you had a good batch of bones. I typically shoot for 8 cups of broth but that really depends on the bones. I would taste it and then decide whether the flavour was too intense. Nothing wrong with it being jelly in the fridge. In fact, if it didn’t I’d think something went wrong. Enjoy! I’ve never tried it with a pressure cooker. No idea if it would work. My understanding of making stock is that liquid doesn’t actually boil in a pressure cooker so when making stock you get a clearer stock. Tonkotsu ramen broth colour comes from boiling so the flavour will probably work but my guess is you won’t get the milky coloured broth. I am going to try this in a pressure cooker today. I”ll let you know how it turns out. I tried making this yesterday in a slow cooker on high for 12 hours. The broth tasted very bland… basically a step up from water. Does cooking on a stove in a stock pot really make all the difference? So excited to make this today!! Erin, the broth is just the first step. When you make the actual ramen you season with one of the tares. Lots of salt in that so no need to add any to the broth. Hope you love it as much as I do! No wonder my broths are tasteless! I’ve been using a slow cooker thinking it’s the best way to get the collagen out. When I put the cooker on high, it actually simmers. Apparently that’s not enough and you need a rolling boil, right? Rolling boil = simmering ?? A rolling boil is just that. The surface is rolling. Way higher than simmer. I have a couple pig’s feet in the freezer I was hoping to use. Could I toss them into this broth or should I cook them separately so they don’t over cook? Hi ! I would like to know what kind of mushrooms I have to use to make this broth. Thank you ! I use the common white mushroom found in grocery stores everywhere in North America. You can google Agaricus bisporus to get a picture. If you can’t get them, you could substitute shitake or cremini. Hi, do I need to add the pork fat? Because I have read that some recipe add them? Is that necessary? If you are referring to fatback, I have done it both ways and like it both ways but I like the cleaner taste when you leave it out a bit better. I find the lighter broth with the richness of the chashu pork works nicely. The little flecks of fat look nice, though but it’s pretty rich if you do it that way. I followed all your instructions, I’m very satisfied with the outcome…. The only thing I’d change next time is…….to not start the 12 hours at 9pm! Lol. Couldn’t get a drop of sleep. Very worth it though. I posted my outcome on my Instagram. I think I left a link on my comment. Cheers! Have a great day! If you’ve noticed, the recipes that call for additional pork fat (fatback) tend to involve either a shorter cooking time or constantly skimming scum from the broth as it boils. Blanching and washing the pork bones like Romain suggests removes most of the actual unwanted parts of the meat before you begin cooking properly, so that you don’t need to skim off nearly as much and therefore aren’t taking the fat out with them. Combined with the long cooking time, this recipe should extract and retain enough fat from the pork without the need to add extra. Not that you can’t add more if you like it extra mouth-meltingly creamy. Hi, I going to give this a shot real soon but thought I’d ask. After removing the bones and straining, what do i do with the mushrooms? Will they still have form and get caught in the straining and if so is there something I can do with it? Are the bones you use split or whole? I ask because I am wondering about the marrow in the bones. I’ve seen people remove it because it darkens the broth, but it seems like a waste of flavor to me. If you use whole bones I’m guessing the marrow stays put without cleaning. Would you recommend using or removing the marrow when making tonkotsu? I take the bones as they come to me from the market. I don’t split them and I don’t clean them beyond the initial step. Whatever marrow is in the bones goes into the pot. I’ve never had a problem but I guess it would depend on exactly what bones you use? Hey, Thanks for all this above. I did one batch, and I want to do another. I was thinking of roasting the pork bones, (after blanching)as well as adding a roasted chicken carcass. Any thoughts? Never tried roasting pork bones for tonkotsu. I do it for my veal and pork stock. It adds a real depth but also an assertiveness that I’m not sure would work for tonkotsu. Chicken is used in ramen broth. Ivan Orkin (Ivan Ramen) does it so it has to be good. It would add another flavour dimension to the stock for sure. Would this technique work with a mix of pork and chicken, or just chicken bones/carcass alone? Classic tonkotsu ramen broth can include some chicken for an extra little bit of complexity so yes to the mix. I have never tried doing it with chicken alone so I have no idea what would come out the other end. If you do try, I’d love to hear how it turns out. When making traditional stock, I’ve always added the onions and other vegetables a couple hours from the end of the boil. Thought being that the vegetables would disintegrate and leave a lot of undesiereable dissolved solids in the stock. Also, I’ve read that onions particularly can impart a burned or bitter flavor if over cooked / over boiled. Given that clarity isn’t an issue here, how do you think about this issue and whether or not boiling the vegetables for the full 12+ hours is necessary, useful, and beneficial or detrimental?? Interesting. When I make concentrated chicken stock I add the onions at the beginning. I cut the onions in half and leave the skin on (I find the skin imparts a bit of extra depth of colour). I’m probably pushing it as hard as I anyone. Not only am I leaving the onion in for the entire cooking time but I am concentrating the flavours down from a full and large pot of stock to a few cups of intense chicken flavour. If the onion was imparting an off flavour that would make it more pronounced. I have never detected a burnt or bitter flavour in the end product and I am pretty sensitive to those two flavours. As far as clarity goes I am always going for flavour over everything else so if my stock is slightly cloudy I can still sleep at night. For the tonkotsu broth all classic technique gets thrown out the window anyway. I put the aromatics in early and they get pretty much cooked to death. I haven’t experimented with adding them in later so I really can’t speak to the effects of adding them in at different times along the way. Is it necessary? I don’t know. Is it beneficial or useful? I know it works and I like it. Is it detrimental? I would say no. I would further qualify that by saying I would never knowingly publish a recipe where I thought something was detrimental to the end product. Thanks so much for the response. I appreciate your thoughts and feedback on the matter. Just added all the vegetables to a pot of pork bones that’s been rolling all night. Used onion, mushroom, but also ginger, leek, scallion and garlic. Figure a couple more hours, then I’ll strain it. Hoping for the best. Cheers and thanks again. So after just a couple of hours rolling boil all of the aromatics were cooked to death. The only things recognizable were the mushrooms and a couple of the tougher onion and leek outside parts. The flavor and texture came out great as well. Tasted a mushroom and there was zero flavor left in it, so I think adding the veg later in the process worked, but probably very little difference vs adding at the start. It was a total pain to strain this stuff though. I think it was mostly the pulpy, former pork, but it instantly clogged every sieve-like thing in my kitchen. Any tips or tricks you’ve found for straining the end product?? Also, do you cool and skim the fat cap, or just stir it in?? There’s kind of a lot of fat here, so if stirred in, I know it’ll taste good, but fear it’ll skim up in the bowl as it cools and not be as picture perfect as what you’ve shown above. Thanks again for a great recipe and your feedback! I’m actually in the middle of making this tonkotsu broth. I started yesterday at 8pm and stopped at 1am because I had to sleep and go to work. I’m planning to start it at a rolling boil again when I come home (to try to achieve 12 hours in total in seperate times). Will that affect anything? I’m glad you found it too! I’ve never tried such a big batch but I think it would just be a bigger pot, enough water to cover all the bones and the same amount of time. As always watch it closely so the water level stays up. Can I use the pork bones that have bone marrow inside?